Up through Jutland runs a north-south "mountain-range" with "peaks" up to 170 m above sea level. This is the highest hills in Denmark. The hills were deposited during the last ice age when the front of the glacier stood still for a longer period in Central Jutland. These modest hights are high enough to give the area a "mountain-climate". The dominating western winds blows humid air in from The North Sea. It condensates over the hills resulting in precipitation as rain or snow. The Mid-Jutland highlands are therfore one of the wettest places in Denmark and some plant species have their main distribution here. Mid-Jutland is the "lake-distrikt" in Denmark because of the very irregular landscape with hills and valleys. 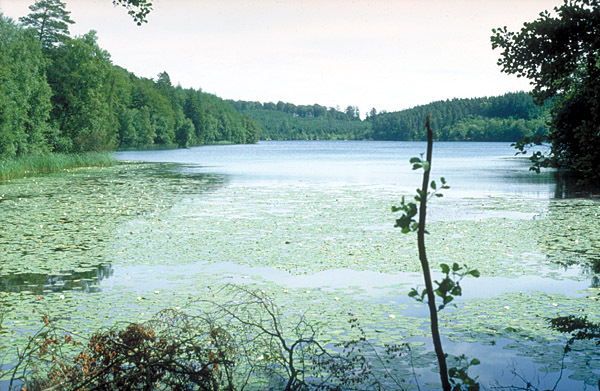 The picture shows the lake Slåensø which is one of the finest lakes in Denmark. The lake contains many species of water-plants and has a rich fauna of especially dragonflies with rare species as Gomphus vulgatissimus and Platycnemis pennipes..